New York Cheesecake Ice Cream Cake. Enough said. Cheesecake is to New York as tea is to London. There’s no two ways about it; cheesecake is quintessentially New York. I hate to burst your bubble, New York, but cheesecake actually originates from Greece. Good thing Greece didn’t get the rights to the name because quite frankly “Greece Cake” sounds revolting! The advent of cream cheese (like all good discoveries, a mistake at first!) truly shaped the taste of cheesecake today. In 1872, a fine dairy man by the name of William Lawrence from upstate NY, attempted to make a batch of Neufchatel (a soft, fresh, cow’s milk cheese from France) when lo and behold he added too much heavy cream and instead created a much silkier and richer cheese. This “mistake” came to be known as “cream cheese.” Until the creation of cream cheese, cheesecakes were typically more coarse and heavy in texture. But, thanks to good ‘ole Will and the creative talents of Jewish New Yorkers (who began swapping this new schmear, aka cream cheese for other cheeses originally in the dessert) we have the famous New York Cheesecake! So, I guess the New York Cheesecake is native to New York, circa 1900s, but the idea of making cheese into a cake form is totally ripped off from Greece, circa 4th Century B.C.E. I have to admit that I absolutely love cheesecake. As a kid, I would dream about going to the Cheesecake Factory just to get oreo cheesecake. Here in NY my favorite cheesecake comes from Cafe Edgar and is smothered in brownies and a fudge crust. It’s heavenly, sinful and indulgent. But that never stops me. So, rather than going to a bakery to buy cheesecake I decided to recreate it at home. A very wise friend suggested that I put cheesecake ice cream into a graham cracker crust for “the total New York Cheesecake experience”. And voila, here you have it! I hope you’ll enjoy this authentic New York Cheesecake Ice Cream Pie. Put oven rack in middle position and preheat oven to 350°F. Lightly butter a flouted tart pan (with a removable bottom, this part is key!). 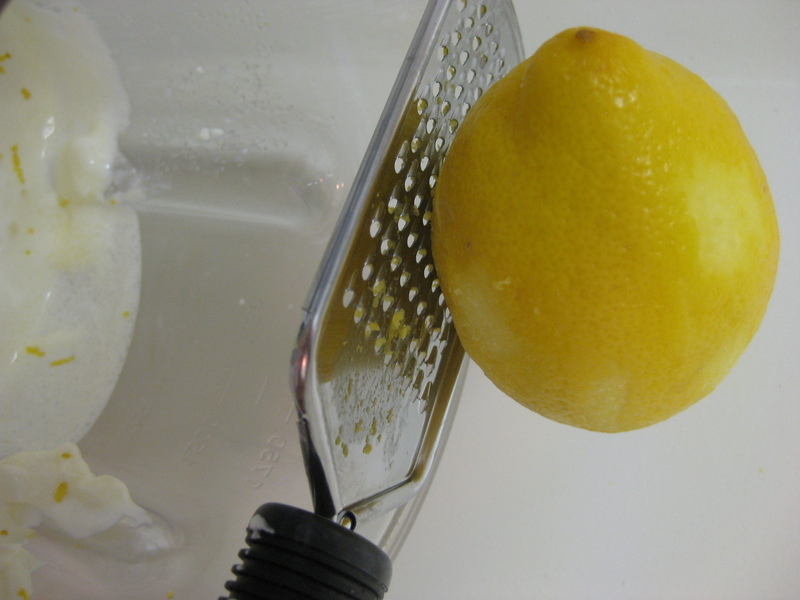 Stir together all ingredients in a bowl and press evenly on bottom and up side of pie plate. Bake until crisp, 12 to 15 minutes, then cool on a rack to room temperature, about 45 minutes. *I used full fat cream cheese and sour cream because, well, why not? instructions. Since this only has a half cup of actual liquid, you may notice that it churns faster than other ice creams. 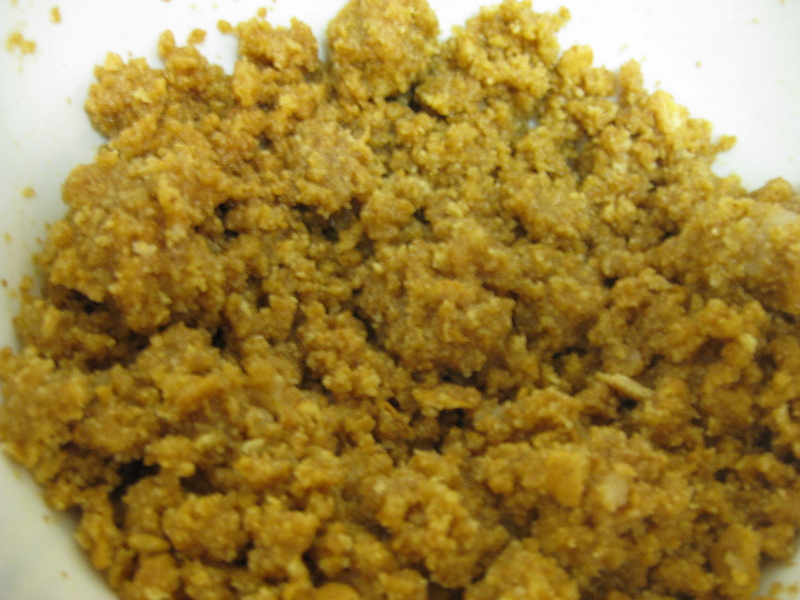 Once finished, pour/scoop into the graham cracker crust and freeze immediately for 10 minutes. 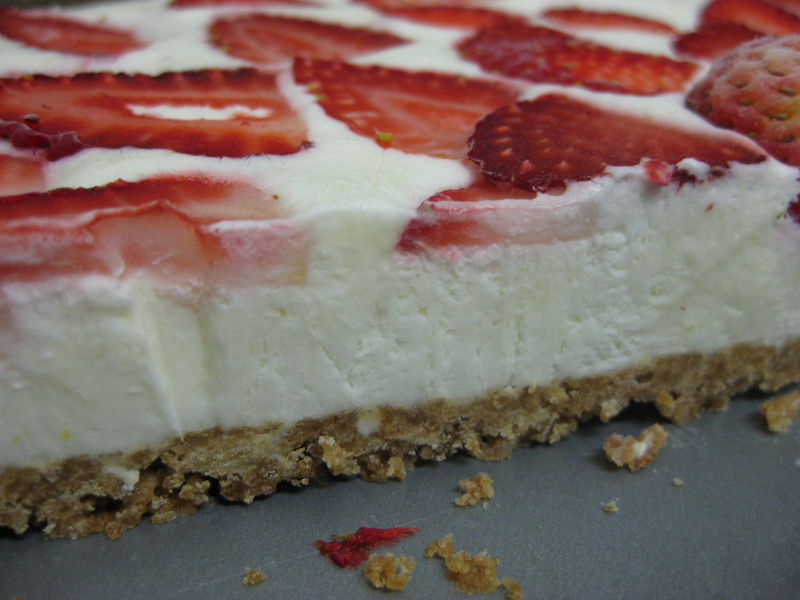 While the “cheesecake” is freezing, thinly slice approximately 10 strawberries for decoration. Remove the “cheesecake” from the freezer and start moving quickly! 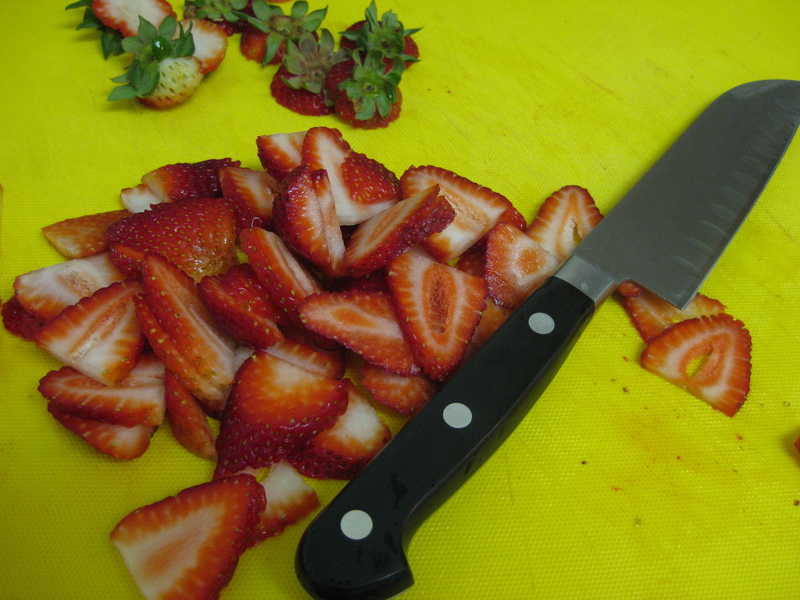 Arrange the strawberry slices in a circular pattern, beginning with the outer-most edge. Continue arranging the strawberries in concentric circles until you’ve reached the center. 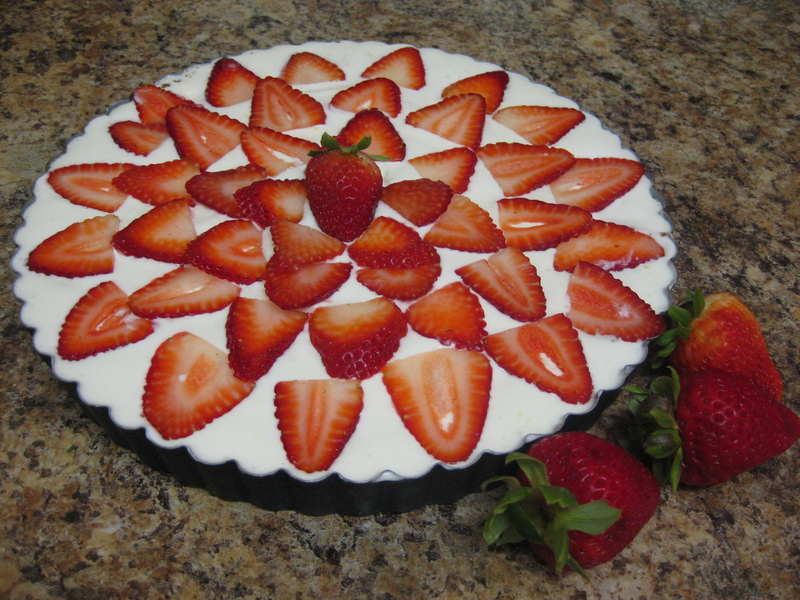 Place a full strawberry in the center and return the dessert to the freezer. Remove from the freezer approximately 5 minutes before you want to eat it. 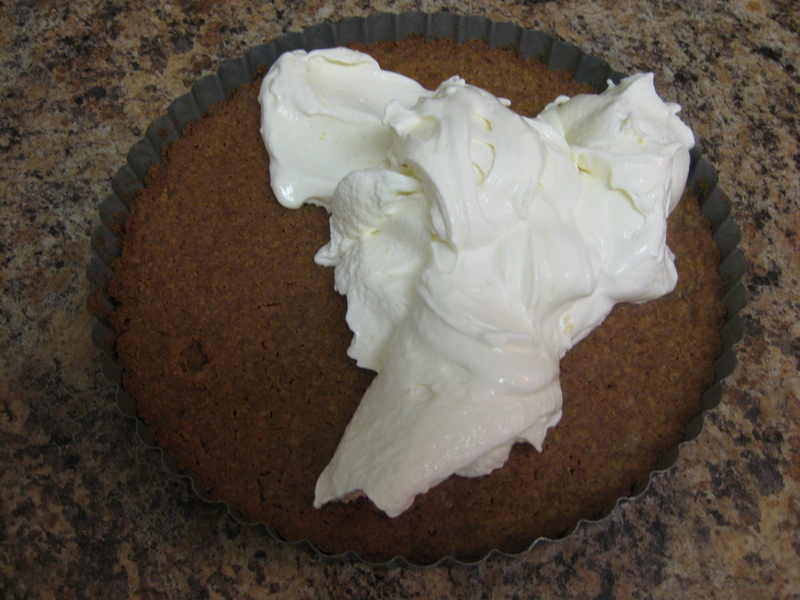 Before serving, lift the “cheesecake” out of the tart pan (the bottom should slide off easily) and slice like a cake. I’m telling you, this dessert is eye candy. And it tastes as good as it looks. A close up...graham cracker crust, cheese cake ice cream, and fresh strawberries. Bottom line, it's delicious. The Verdict: Sinful. This dessert was a hit. If you’re like me and eat with your eyes, than this dessert is perfect. Because it’s so visually appealing, you have no other choice but to dig in. I should note, however, that if you’re looking to enjoy a nice big scoop of ice cream, than this dessert is not for you. Because the ice cream is molded into a tart pan, it’s much thinner than your average scoop. The good news is that the cake melts so perfectly, and is so utterly creamy, that each bite is more delicious than the next. Trust me.